The Monroe house is going mad with excitement. Pete has just won a contest, and the prize is a school visit from none other than M. T. Graves, Pete's idol and the bestselling author of the FleshCrawlers series. He's even going to stay with the Monroes while he's visiting! Harold and Howie are thrilled, but Chester the cat is suspicious. Why does Graves dress all in black? Why doesn't the beady-eyed crow perched on his shoulder say anything? Why has a threatening flock of crows invaded the backyard? And most worrisome of all: In each of the FleshCrawlers books, why does something bad always happen to the pets? Suddenly, Graves's interest in all of the animals -- especially Bunnicula -- looks far from innocent. 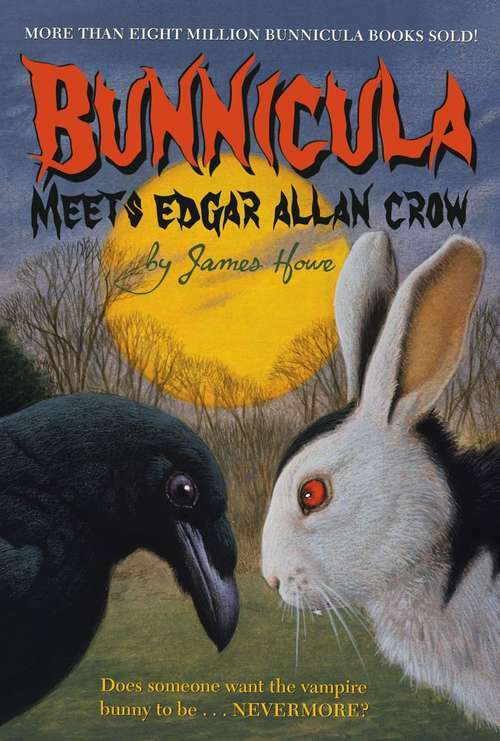 It's up to Chester, Harold, and Howie to find out if M. T. Graves and Edgar Allan Crow are really devising a plot to make their beloved bunny. . . NEVERMORE.